Is your quest for clean air improving operations or getting in the way? It’s no mystery that airborne particulates are a challenge in industrial manufacturing, especially for large-scale manufacturers that fabricate, assemble or produce complex products. Meeting this challenge with traditional mitigation solutions such as localized ventilation can lead to increased disruption and costs downstream. 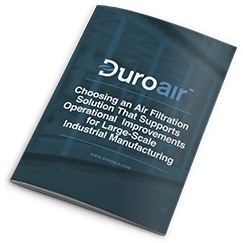 This white paper explores an alternative approach — bringing the air filtration solution to the workpiece — as an opportunity for large-scale manufacturers to go beyond compliance and streamline their entire manufacturing operation. Download your free copy today to start evaluating the bottom-line benefits of your existing air filtration solution.